Dave’s grandfather worked as a fireman on a railroad in the east and his dad worked security on the Ogden Union Railroad and Depot. 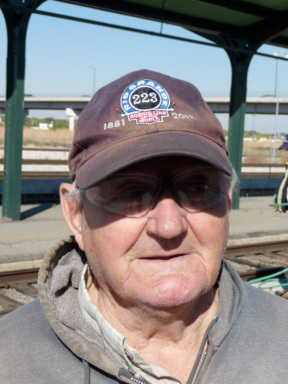 When Dave was a young man he worked as an “oiler” here in Ogden making sure the wheels of freight and passenger cars ran smoothly. 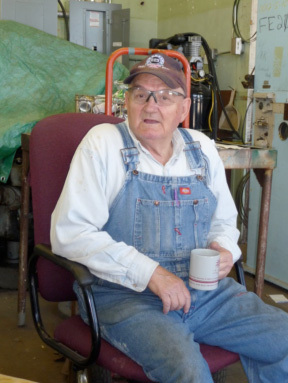 He remembers that when the Timken bearings became popular, he lost his job as an oiler. He doesn’t remember what he was paid in the fifties, but says it wasn’t enough for the way he looked at the end of the day. Dave does remember the day the big #844 was in town in 2008 and when walking the length of the train, he wound up in our current shop. He was hooked! Dave hasn’t missed a Saturday in the shop since the day he became a volunteer. He looks forward to doing odd jobs, but is most proud that he is part of the hot riveting team. Dave grew up on a local farm and remembers the time he enjoyed driving his dad’s tractor. Someday, when the #223 is up and running he hopes to drive it also. Dave states that he recommends volunteering at the shop because whenever he pushes the door open, his troubles fall on the ground outside.